The 787 Dreamliner is powered by new-generation engines from GE and Rolls-Royce that offer improvements in fuel consumption, noise, and emissions. Engine manufacturers have developed systems that represent nearly a two-generation jump in technology. The 787 uses new engines from GE and Rolls-Royce. Advances in engine technology are the biggest contributor to the airplane’s overall fuel efficiency improvements. The new engines represent a two-generation jump in technology over the 767. This article gives an overview of the basic features of the 787 propulsion system, comparing it to the 767 system it replaces. The article focuses on how the design achieves fuel consumption, noise, and emissions improvements and discusses operating and maintainability features as well as overall cost-of-ownership reduction benefits. Starting in 2002, Boeing’s analysis indicated a strong market demand for a twin-aisle airplane with 767-class payload capability at significantly enhanced range. This finding was consistent with airline evolution from a hub-and-spoke to a point-to-point operational model. Enabling enhanced range in this seat class demanded significant advances in overall airplane design with a large portion of this burden given to the propulsion system. Higher propulsive efficiency through increased bypass ratio. Higher engine thermal efficiency through increased overall pressure ratio and improved component efficiencies. Improved thrust-to-weight ratio through the application of advanced materials. Introduction of a novel dual-use electrical power generation system that doubled as the engine start system. Comparison of GEnx-1B and Rolls-Royce Trent 1000 with a table that compares key characteristics of these engines to 767 engines. In addition to the improved fuel burn requirements, the 787 propulsion system also had to meet more stringent noise and emissions requirements. Finally, in order to maximize the capital value of the airplane, Boeing decided that the propulsion systems should be designed for full interchangeability between the two engine types. Replaces the heritage bleed air system used to feed the airplane’s environmental control system, thereby realizing direct weight savings through the elimination of relatively heavy bleed air components such as regulation valves, ducting, and coolers. Eliminates the energy loss of the bleed air system pre-cooler. Eliminates the throttling losses of bleed air provided from discrete engine compression stages. Eliminates the single-purpose air turbine starters and their associated oil system and maintenance. Simplifies the auxiliary power unit (APU) design to be a shaft power-only machine. Provides high flexibility with existing airport ground support infrastructure. Is fully self-contained with its own lubrication system and the ability to be disconnected self-protectively, manually or remotely, through flight deck controls. The variable frequency starter generator delivers many benefits, including the replacement of the heritage bleed air system. The 787 main electrical power generation and start system is a four-channel variable frequency system with two 250 kVA VFSGs on each of the two main engines. The power from these generators is supplied to the main load buses through generator feeders and generator circuit breakers (see fig. 3). The variable frequency starter generator is a six-pole machine within an aluminum housing driven directly from the main engine gearbox. The generator is a brushless, three-phase, alternating current, and variable frequency synchronous machine. It has a nominal rating of 235 volts alternating current (VAC), 250 kVA, three phases, and 360–800 Hz output. Controlling each VFSG is a dedicated generator control unit (GCU). The GCU is a line replaceable unit (LRU) housed inside the aft electrical equipment bay. The GCU’s principal function is to provide voltage regulation and fault current limiting while in the generate mode. The GCU also supports the main engine start function. Controls bus configuration and engine health monitoring. Provides standby system control, generating source load management, and main and APU engine horsepower load management. Acts as the electrical power system communication gateway with other systems and flight deck. Built-in redundancy in the BPCU enhances system reliability and operational flexibility. The common motor start controllers (CMSCs) are used to control the VFSG start function and properly regulate torque during the start sequence. Once the engine is started, the CMSC switches over to controlling the cabin air compressors, thereby performing a second function. The electric start system affords maximum flexibility from a variety of power sources: APU generators, external power cart, and cross engine (opposite engine VFSGs). The VFSG system provides full maintenance diagnostics for both the entire system and all LRUs. Both 787 engine manufacturers incorporated the latest technology offerings from their extensive research and product maturation programs. Leverage the highly successful GE90 composite fan blades with the latest swept aerodynamics. Incorporate an entirely new composite fan case for significant weight savings. Field the enhanced twin annular pre-swirl combustion system that achieves significant emission reductions while preserving low pattern factor for turbine durability as well as excellent re-light characteristics. Introduce surface air-oil coolers to compactly reject the VFSG and engine oil heat. Incorporate state-of-the-art titanium aluminide (Ti-Al) blades in the last two stages of the seven-stage low pressure turbine. Ti-Al achieves significant weight savings over traditional nickel alloy. Incorporate the latest swept aero hollow-fan-blade technology evolved from the predecessor Trent 900 engine. 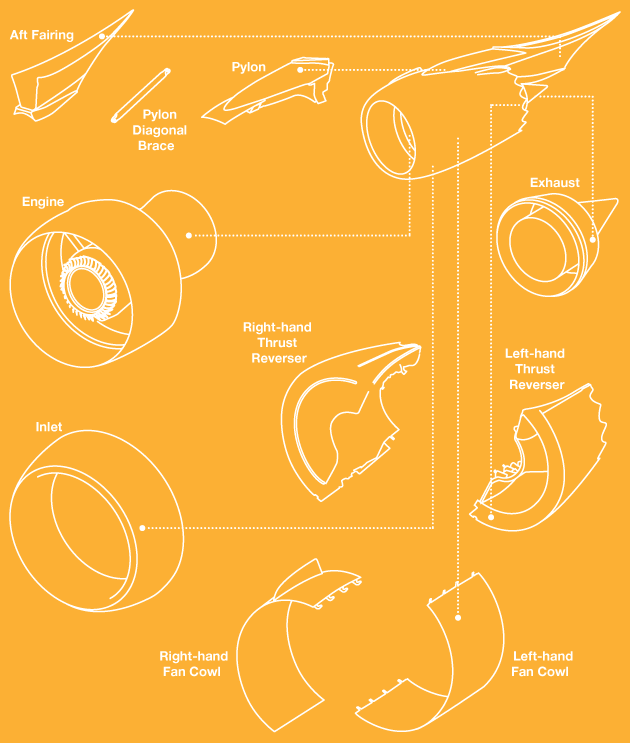 Utilize the proven benefit of the Trent three-spool engine architecture. In the case of the Trent 1000, the three-spool design affords intermediate pressure power off-take with demonstrated benefits in engine operability and fuel consumption. Incorporate surface coolers for compact and efficient rejection of VFSG and engine oil heat. Design the Trent 1000 with the latest computational fluid dynamics-enabled 3D aerodynamics for high efficiency and low noise. 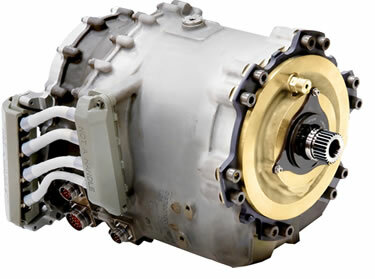 Allow power to be extracted for each VFSG through the second of the three engine shafts. 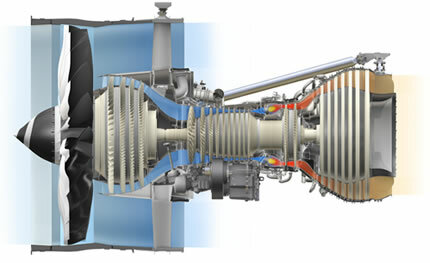 This unique solution using the Trent 1000 engine architecture brings with it lower engine idle speeds, which reduce fuel burn and noise on the 787. A single-piece inlet barrel construction for low noise. A proven translating sleeve thrust reverser system that utilizes compact state-of-the-art 5,000 pounds per square inch (psi) hydraulic actuation. Advanced titanium alloy exhaust system components. This view of the nacelle shows the inlet, fan cowls, thrust reverser, exhaust plug, and nozzle. The 787 propulsion system was rigorously tested, both to achieve basic certification and to demonstrate full service readiness and extended operations (ETOPS) capability when the 787 entered service (see fig. 5). 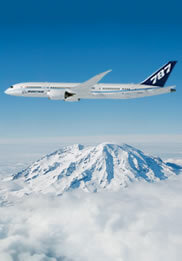 Intense engine development and 787 flight test programs contribute to the engines’ service readiness and durability. The engine test program incorporated more than 20 dedicated test engines between the two engine manufacturers. Beyond testing for basic engine certification, each engine type completed 3,000 cycles of ETOPS flight testing. The engine test program was started far in advance of the Boeing flight test program. Multiple flying test beds identified necessary modifications prior to the Boeing flight test program. A two-year, six-airplane 787 flight test program led to type certification in August 2011 and entry into service in October 2011. The 787 propulsion controls are designed for maximum commonality with the 777 architecture, while incorporating the latest customer-driven improvements. The cockpit provides engine-starting controls, forward and reverse thrust manual control, autothrottle control, and engine-indicating and crew-alerting system (EICAS). 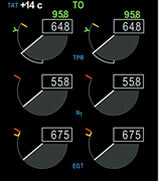 During normal operation of the airplane, the flight crew monitors engine data on the primary flight display (see fig. 6). The display can be set to show the full normal display, both primary and secondary engine parameters, or an abbreviated compact display with only primary parameters. The flight deck displays can be set to show the full normal display with both primary and secondary engine parameters (left) or an abbreviated compact display with only primary parameters (center). 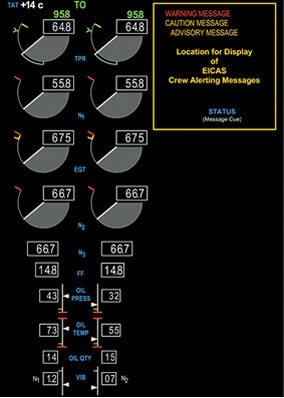 A normal display (right) shows the location of engine-indicating and crew-alerting system (EICAS) messages. An engine is shut down. A secondary parameter goes out of normal operating range. The display is selected by the flight crew. To the right of the engine parameter display on the EICAS primary display is the location for displaying flight crew alerting messages. The text of warning, caution, and advisory messages is displayed to alert the flight crew to non-normal conditions. The 787 propulsion system incorporates the latest generation of central maintenance and engine health management systems. Central maintenance system. 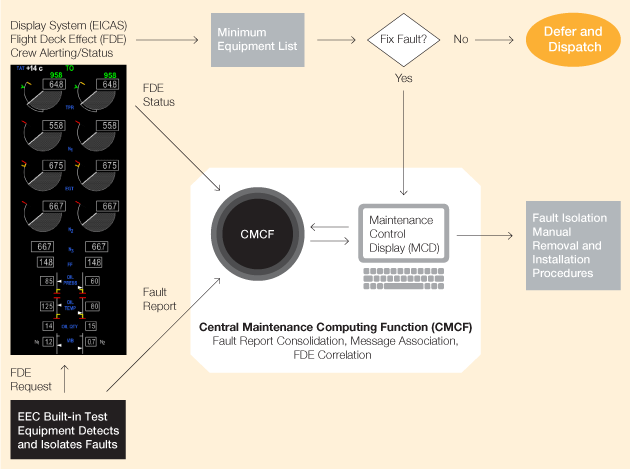 Through centralized fault reporting, the 787 onboard maintenance system (OMS) aids the airline mechanic in rapidly isolating faults and guiding the appropriate maintenance action (see fig. 7). The OMS is an essential tool in maintaining rapid airplane turnaround rates and maximizing dispatchability. The 787 onboard maintenance system helps mechanics rapidly isolate faults and guides appropriate maintenance action. 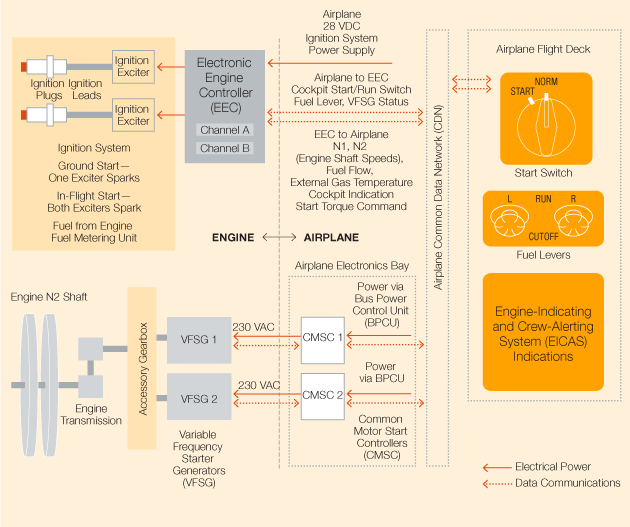 Engine health management system. Each engine manufacturer provides a dedicated engine health monitor that has vibration monitoring and fan trim balancing functions and sophisticated engine parameter trending for maintenance planning. The new-generation engines powering the 787 airplane offer operators improvements in fuel consumption, noise, and emissions. 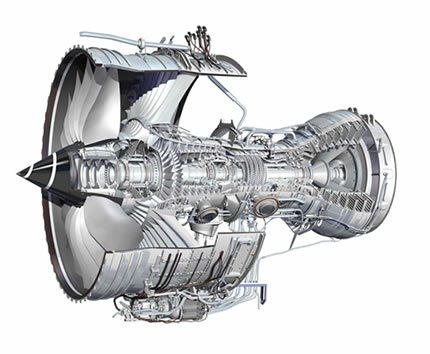 Both GE and Rolls-Royce have developed advanced engine systems that deliver nearly a two-generation jump in technology. Boeing Home | Commercial Airplanes | Contact AERO | AERO Copyright © 2012 The Boeing Company. All rights reserved.